Nikko and Tobu World Square; around the world in one afternoon. 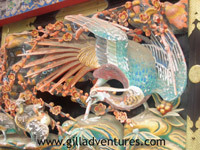 The girls had reached their limit of temples and shrines. 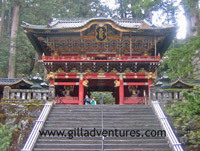 We had spent the better part of the day touring Toshogu Shrine, the mausoleum and surrounding grounds and temples of Tokugawa Ieyasu, the first Tokugawa Shogun. Along with this, we visited the mausoleum of his grandson and the Rinnoji Temple, and its museum of Buddhist artifacts, and they were dragging their feet. The morning had been my pick. This was the one thing on my “must see” list for this trip to Japan, and the main reason I had pushed to see Nikko. That’s not to say that Nikko has a shortage of other beauty. This is a place with an abundance of history. So much so, that the fact that the Nikko train station was designed by Frank Lloyd Wright is hardly worth mentioning in tour guides or in the building itself. 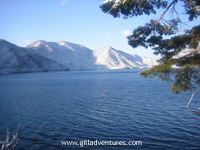 Our hotel was on the mountain above town, overlooking Lake Chuzenji. The area around the lake is magnificent, with waterfalls, mountains, and macaques. We had only one full day to spend in Nikko itself, and these sites were not to be missed. 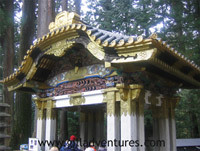 There is a strong Chinese influence in the structures here, painted bright reds with gold overlays. Much different from the natural wood and stone structures we found in Kyoto.